We want everyone evaluating, developing on, or preparing WSO2 products for production deployments to have the best experience and especially not trip over a bug that has already been fixed! WSO2 Update Manager (WUM) makes this process much easier – now you can get access to latest updates as and when we release them. 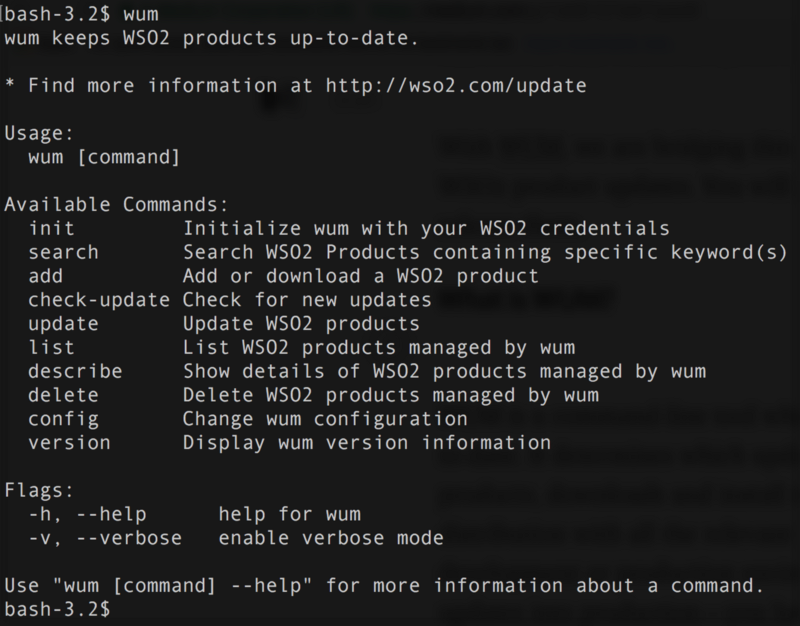 WUM is a command-line application which allows you to keep WSO2 products up-to-date. It determines which updates are new and relevant for your WSO2 products, downloads and installs them. WUM builds you a new product distribution with all the relevant updates; this distribution is ready to deploy into your development or production environment. Note that WUM will not push updates into production: you have full control over when and how you want to such pushes to occur. Updates are available for the following products and versions. We are in the process of adding more products and versions. Note that fresh WSO2 product distributions downloaded via the wso2.com site or using WUM, are licensed under Apache 2. However, product distributions built by WUM with updates installed are licensed under WSO2 Update License 1.0. The updated product distributions are not licensed for use in production without a valid WSO2 subscription. Visit http://wso2.com/support for more information about WSO2 subscription. You can download WUM from http://wso2.com/wum. Download the binary release suitable for your operation system and processor architecture. Binary distributions are available for Linux, Mac OS, and Windows (follow installation instructions available on the same download page). Once the installation is completed, open a new terminal and execute the following command. You should get the help page with all the available commands. You need to have a WSO2 account to get started with WUM. If you don’t have an account with WSO2, please create one here. You need a WSO2 account to start using wum. Use "wum [command] --help" for more information about a command. WUM maintains a local product repository in your machine where it stores WS02 product distributions. Whenever you update a product, WUM creates a new distribution with all these updates and stores it in this repository. By default, WUM creates this repository in the user’s home directory, but you have the option to change this as well. Before you update any WSO2 product, you need to add the product to your local product repository. You can either download a product or add an already downloaded product. If you are not sure about what product name to use, you can use the ‘wum search’ command. If you run the search command without any arguments, it will list all the WUM supported WSO2 products. You can also search using keywords. If you look at the examples given in the “what’s next” section, you would see the expected format of the product name to use. Use the following command if you want to add the latest version of wso2esb. The following product(s) will be downloaded. After this operation, 218.1MB of additional disk space will be used. You also have the option to add an already downloaded product distribution using the add command. Now try the following command to see the list of add products. As I’ve explained earlier, WUM creates a new product zip file with all the updates installed. But if you want to check whether updates are available before you attempt to update, you can use the “check-update” command as follows. [WARNING] 11 critical security updates. WSO2 strongly recommends that you install these updates now. [WARNING] Your credentials are not associated with an active WSO2 subscription. Please remember that updates are not licensed for use in production without a valid WSO2 subscription. See: http://wso2.com/wum for more details. * [WARNING] WSO2 strongly recommends to use this updated product for production as soon as possible. If you don’t have an active WSO2 subscription for wso2esb, you would get a warning as above. This means you can use the updated product for your development activities, but you are not supposed to use it in production. Once the update is completed, you should be able to see the updated product files in your local repository. We version updated product distributions using the timestamp of the latest update. There are several WUM commands available for you to manage your local product repository. The “wum list” command lists all the available products. If you want to get more information about a product, you can use the “wum describe” command. It gives you the location of the product file and update history, among other information. In case you want clean up your product repository by deleting files, you can use the “wum delete” command. The following product file(s) will be deleted. The above command will delete all the wso2esb-4.9.0 product files including the updated files. List, describe and delete commands accepts a product pattern; therefore you can filter out products by given a particular pattern. We’ve released the Beta version of WUM. Try it out and let us know what you think.